Glorious morning sunshine played its part during the recent Armed Forces Day flag raising ceremony held at Centenary Gardens, Beddau. The annual service, which is run by Llantrisant Community Council, was led by Creighton Lewis OBE supported by members of Llantrisant Ladies choir who sang the hymn “As the Deer Pants for Water”. School children and teachers from Llwyncrwn, Gwaumeisgyn, Tonysguboriau and Llantrisant Primary Schools, Y Pant and Bryncelynnog Comprehensive schools attended, with 2 pupils from Gwaunmeisgyn Primary School assisting with the readings. 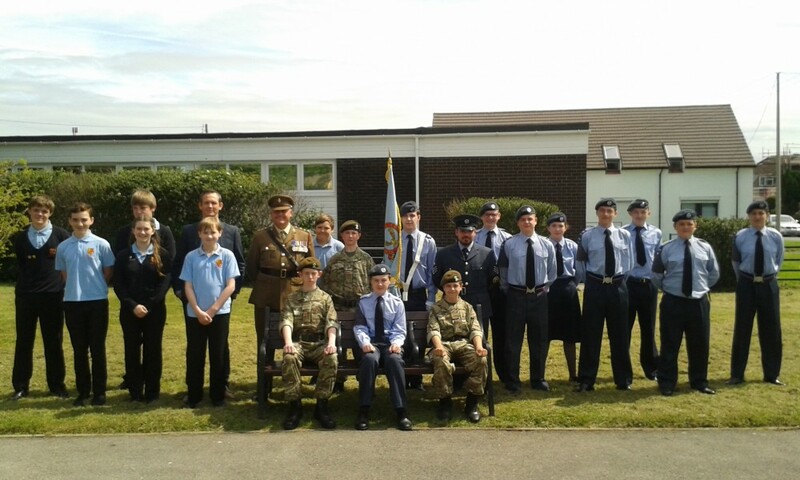 Standards and representatives attended from The Royal British Legion Beddau Branch, Pontyclun 2077 Squadron Air Cadets and C Company Dyfed and Glamorgan Army Cadets (both of whom meet in Talbot Green) and for the first time we were pleased to welcome the Rhondda Sea Cadets. The event concluded with a get together in the Cwm Welfare hall which offered servicemen, children, teachers and the community an opportunity to share knowledge and experience over refreshments. Cllr David Nicholas, Vice Chair of Llantrisant Community Council said “we were very pleased with the support shown by the local schools and cadets, it is important that the young people of today have an understanding of the role the Armed Forces have in our society”.